The fair will again start on Monday this year with ALL livestock arriving on Monday, August 12, 2019. See the Show Schedule page for weigh-in times. FITTING CONTEST- The fitting contest will also move to Monday, August 12 at 8:00 pm. The contest will be held in the ring. There will be a form for entry of the contest to mail in at the time of livestock entries. There is $20.00 per team entry fee to enter the fitting contest. BEEF SHOW TIMES – This year the Market Steer show will begin at 8:00 am, followed by the Bucket Calf show at 11:00 am. The Open Beef show will begin at 1:00 pm. MARKET BROILER SHOW – We have added a Market Broiler Show for junior exhibitors. Chicks must be purchased from Coffeyville Feed and Farm by June 1, 2019. Exact date for delivery will be posted on Facebook. Either six or twelve chicks may be purchased with the pen being made up of the best three chickens. Chickens must have ID wing band in place matching purchase records at time of show. Champion and Reserve Champion will be sold at premium sale. 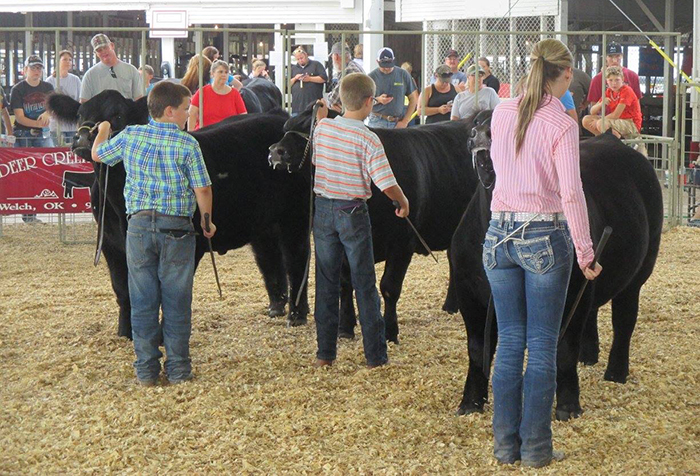 JUNIOR LIVESTOCK SALE – The Junior Livestock Sale will be on Friday August 16, 2019. Exhibitors making the premium sale must be in the sale ring when his or her animal is sold unless attending a state 4-H or FFA competition and PRIOR approval by the livestock committee had been granted. Exhibitors making the sale will need to pick up their sale shirt Friday August 16, 2019 starting at 2:00 pm. ALL exhibitors making the sale will need to be at the sale ring at 3:30 pm for a picture. A lot of respect can be earned or lost by our ability to say thanks. Thank you notes help our sponsors and premium buyers realize that the sponsorship really means something to you. It helps make them more interested in sponsoring next year. PLEASE remember to send your premium buyer along with our sponsors a thank you. All livestock entries will need to be mailed or turned in to the Coffeyville Chamber. No entries will be accepted at any other locations. ENTRY FORMS ARE DUE JULY 15, 2019. A nomination form is NOT an entry form. You will need to complete an entry form to be entered in the fair. Late entries will be accepted until July 25, 2019 with a $20.00 late fee added. ALL breeding stock will need to have tag number, ear notch, tattoo, or some form of identification listed on entry form. ALL livestock entries will need to be mailed or turned in to the Coffeyville Chamber. NO entries will be excepted at any other locations. All forms are available on the Entry Forms and Fees page, and in the premium book. If an entry form is not received nomination is considered ineligible to show. HEALTH PAPERS – Each family MUST have their own health papers. The ISF tag as well as official identification MUST be listed on the health paper. Tags should be in the animals when nomination forms are done. Active 4-H and FFA members residing in Montgomery, Labette, and Chautauqua counties in Kansas and Craig, Nowata, and Washington counties in Oklahoma. The only eligible exhibitors will be those that nominate entries by the deadline. To meet age restrictions, applicants must not be 20years old before September 1, 2019. The only eligible exhibitors for the market shows will be those that nominate entries by the deadline. STEERS/MARKET HEIFERS : Angus, Charolais, Chiangus, Hereford, Limousin, Maine-Anjou, Shorthorn, Simmental, and Crossbred. BARROWS : Berkshire, Chester White, Duroc, Hampshire, Poland China, Spotted Poland China, Yorkshire, and Crossbred. LAMBS : Dorset, Hampshire, Shropshire, Southdown, Suffolk, Crossbred, Speckled Face, and Natural. Meat Goats : Will be shown by weight. 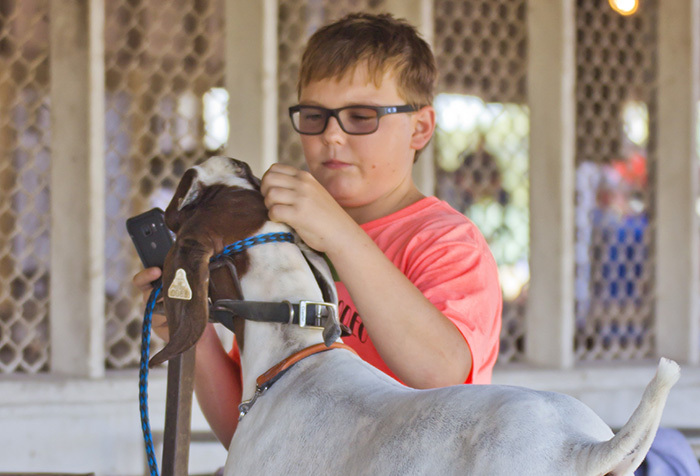 A 2019 Inter-State Fair and Rodeo Livestock Show Entry Form must be completed and postmarked by July 15, 2019. Late entries will be accepted until July 25, 2019 with a $20.00 LATE FEE. A nomination form is NOT an entry. If an entry form is not received, nomination is considered ineligible to show. Please provide correct mailing address and both parents names of each exhibitor on the nomination form. All animals must be owned and cared for by the applicant. An applicant can nominate an UNLIMITED number per division but only TWO nominated animals can be shown per division. In the event that any steer, barrow, sheep, or market goat applicant drops their project after May 15, 2019, another 4-H or FFA student cannot be substituted in his/ her place. All animals will be nominated by breed except market goats. Any animal nominated in the wrong breed as determined by the superintendent will be placed in the CROSSBRED class of that division. Any entries that do not have a breed specified will be entered in the crossbred class. At least five entries will be required to make a single breed class. If any breed have less than five entries it will be placed in All Other Breed. All nominations must be made in one of the above breeds. No nominations can be made as AOB. Market steers and market heifers will require three entries to make a single breed class. All breeding stock MUST have a tag number, ear notch, or tattoo listed on entry form. Animals losing a tag must be reported immediately and retagged. Animals must have an ISFR tag at the time of weigh-in or may be ineligible to show and sent home. NO ANIMALS WILL BE TAGGED AT WEIGH-IN. Barns will open at NOON on Sunday, August 11 for all market and breeding stock. All livestock entries must be in place by designated weigh-in/check-in time. Rabbit and Poultry Check-in – 12:00 p.m.
Market Broiler Weigh-in – 2:00 p.m.
All steers and market heifers making the premium sale must go to an approved locker. The approved lockers for the Inter-State fair and rodeo are: Oswego Locker, M & M Custom Butchering, McFerron Quality Meats, Cook’s Processing, Peck’s Custom Butchering, and Anderson Processing. Animals for exhibit purposes only will be accepted if space is available and stall fee paid. No decision on accepting these special animals will be made until after all regular entries have been assigned. Tie-out time is from 8 p.m. to 8 a.m. All livestock must be in the barns or at the fair board designated tie-out. No cattle pens in the barns. All cattle must be tied. All exhibitors furnish own bedding. No sawdust will be supplied. Pens and stalls must be kept clean and neat at all times, and exhibitors must clean their pens/stalls following the conclusion of the fair. Failure to keep pens/stalls clean may result in being barred from the Market Livestock Sale and/or being barred from showing the next year. Health and Fair regulations will be strictly enforced. All exhibitors must be prepared to comply with USDA requirements regarding implants or drugs. The Inter-State Fair reserves the right to blood and urine test any market animal. Showmanship will be judged during the show with a call back for the top individuals in junior and senior age divisions. Prizes will be awarded to the top five in each age division. Exhibitors must accompany their animals, care for them and be present to exhibit their entries. If an exhibitor has two animals in the same class, he or she, with prior approval of the superintendent, may have another exhibitor assist by showing that animal. Applicant must wear appropriate clothing while in the show ring. ALL SHIRTS MUST HAVE A COLLAR FOR JUNIOR MARKET SHOWS AND SHOWMANSHIP. No torn or ripped clothing and no ball caps. No adults, except the judges and ISFR staff will be permitted in the show ring while the animals are being judged. Violation of this rule may disqualify the applicant. There will not be a jackpot for any of the market shows. The Grand Champion Barrow, Lamb, Market Goat, and Steer must sell. A maximum of 112 animals will be sold in the sale. An applicant is eligible to sell only one animal in each division. All animals sold through the Junior Market Livestock Sale must be slaughtered at a designated packer. The Montgomery County Fair Association will not be liable for any loss incurred during the 2019 Fair, shipping to the packer or due to the packer rejecting the carcass. No glitter, adhesive, or paint will be allowed on premium sale animals. All animals will be handled in a humane manner in accordance with the accepted animal husbandry practices. Any animal that dies must be removed from the premises immediately by the exhibitor. All animals must be removed from all barns by 11:00 P.M. Friday, August 17, 2019. No exceptions. Two (2) parking passes will be made available to each family exhibiting livestock. These passes will allow parking in the designated livestock parking lot only and may be picked up in the livestock office beginning at 9:00 a.m., Monday, August 13, 2019. Additional parking passes are available for $20 each. The ISFR Livestock Committee reserves the right to disqualify any applicant not complying with these rules and regulations. Will be weighed in onMonday August 12 from 10 a.m. to noon. Steers must weigh a minimum of 1100 pounds to be eligible for the sale. All steers or market heifers that make the premium sale must go to an approved locker. Oswego Locker, M & M Custom Butchering, McFerron Quality Meats, Cook’s Processing, Peck’s Custom Butchering, or Anderson Processing are approved lockers. Three head are needed to make a breed. If three head are not present, the entry will be placed in the AOB class. All animals must weigh at least 1100 pounds at weigh-in to be eligible for the premium sale. Any animal nominated in the wrong breed as determined by the superintendent and/or classifier will be placed in the CROSSBRED class of that division. Any entries that do not have a breed specified will be entered in the crossbred class. All barrows will be weighed in on Monday, August 12 from 5:00 p.m. to 7:00 p.m. Unload at the west gate of the hog barn only. Health papers will be checked before you are allowed to unload. All barrows and their ISF tag must be clean at the time of weigh-in. Barrows must weigh a minimum of 200 pounds to show and 220 pounds to be eligible for the sale. All swine originating from a stage IV or V state do not require a pseudo-rabies test. Note: Kansas and Oklahoma swine meet the state IV or V requirements for pseudo-rabies and therefore, do not require a test. Swine originating from a state that does not qualify are to have a negative serum neutralization test for pseudo-rabies within 30 days prior to entry and herd or origin shall have no pseudo-rabies within 12 months or originate from a qualified pseudo-rabies free herd. Qualified pseudo-rabies free herd numbers shall appear on the health certificate. Swine which have been vaccinated for pseudo-rabies will not be allowed to enter Kansas. Offspring of vaccinated swine are allowed as long as tested negative for pseudo-rabies within 30 days of entry using the serum neutralization or latex test. At least five entries will be required to make a single breed class. If any breed has less than five entries, these entries will be entered as AOB. Lambs will be weighed in on Monday, August 12 from 4:00 p.m. to 5:00 p.m.
All lambs must weigh a minimum of 90 pounds. Lambs must weigh a minimum of 100 pounds to be eligible for the sale. Lambs must be slick shorn with even length of wool covering above the hock and knee. Wool length should not exceed 0.2 inch. Lambs with excessive or uneven wool cover will not be weighed or checked in until shorn. All lambs must have a scrapies tag. All lambs cannot have their yearling teeth up and in wear at the time of the fair. Any lamb, which in the opinion of the official mouther, having their permanent incisors up and in will be excluded from entry in the show. At least five entries will be required to make a single breed class. Meat goats will be weighed in on Monday, August 12 from 3:00 p.m. to 4:00 p.m.
All goats must weigh a minimum of 50 pounds to be eligible for sale. All meat goats need to be slick shorn at time of weigh-in. All meat goats must have scrapies tag. All goats cannot have their yearling teeth up and in wear at the time of the fair. Any goat, which in the opinion of the official mouther, having their permanent incisors up and in, will be excluded from entry in the show. Entries postmarked by July 15, 2019. Purchased by June 1, 2019 from Coffeyville Feed and Farm. Purchase 6 or 12 birds, best three to make up your pen. Must have wing bands in place matching purchase records at time of show. After birds are officially weighed, they cannot be removed from the assigned cage. USDA Wholesome Meat Act applies to ALL Market Birds. Only animals eligible for immediate slaughter may be brought on the grounds to exhibit. Ideal weight 6lb per bird live weight at weigh-in. Birds will be judged on uniformity of weight, shape, type, and fleshing. Interstate Fair and Rodeo will in no way be liable or responsible for the condition of carcass or sale price of animals. The Grand and Reserve Grand Champion Market Broiler Pens will qualify for the Junior Livestock Sale. Market Broiler Show is open to youth who are active members of 4-H or FFA residing in Montgomery, Labette, and Chautauqua counties in Kansas and Craig, Nowata, and Washington counties in Oklahoma. All animals need to be individually identified by tattoo, metal ear tag, registration number, or breed association ear notch for swine. Please include all existing identification on health certificate. Animals with active lesions of ringworm or warts visible without close examination, or infested with mange, as determined by officials of the Animal Health Department or designated fair staff, will not be permitted to exhibit and must be immediately removed from the premises. All tests must be conducted in a state-approved laboratory. All health papers must be presented when animals are checked and weighed in. All cattle, including bulls, must be accompanied by an official health certificate issued within 30 days of exhibit. Originate in and constitute a part of a certified brucellosis-free herd. Herd certification number must be entered on the health certificate. Originate from a USDA brucellosis-free classified state. No test required. Official calf-hood vaccinated animals of beef breeds under 24- months of age and dairy breeds under 20-months of age may show without a brucellosis test. Vaccination tattoo symbol must appear on health certificate. Cattle not qualifying under first four items must indicate a negative blood test for brucellosis in a State-Federal Laboratory in all animals over 18-months of age within 60 days of the show date. Out-of-State cattle must comply with Uniform methods and Rules for inter-state movement requirements according to classification of their state. Prior Kansas permit required from Texas. Test eligible age is 18-months for non-calf-hood vaccinated animals. For calf-hood vaccinated animals, see #3 above. Originate in and constitute a part of a TB accredited herd. The TB accredited herd number must appear on the health certificate. Originate from USDA classified “TB free” state. Cattle not qualifying under first two items must be tested negative to TB within 90 days of the show, except steers and calves under six months of age. NOTE: Kansas, Oklahoma or Iowa cattle are not required to be TB tested. All breeding swine over six months of age must have a negative brucellosis test within 60 days or originate from a validated herd; validation number shall appear on the health certificate. All sheep must be accompanied by an official health certificate issued within 30 days of exhibit. Have your local veterinarian examine your sheep for sore mouth and fungus infection. All exhibitors please leave official health certificates in the sheep superintendent’s office. The certificates will be examined by personnel of the Kansas Animal Health Department or designated show staff. All sexually intact (ewes and rams) must be identified with an official USDA premise ID Tag. This includes Market Ewe lambs and Wether Dams. Questions: 785-296-2326. All goats must be accompanied by an official health certificate issued within 30 days of exhibit. Exhibitors please leave official health certificates in the goat superintendent’s office. The certificates will be examined by the superintendent. No TB or Brucellosis test required. Goats are included in the above Premise ID Tag requirement. If you have any questions please contact the Livestock Chairman, Lori Rexwinkle at 620-252-5935.